Certain fish species are just icons for their respective scenes. 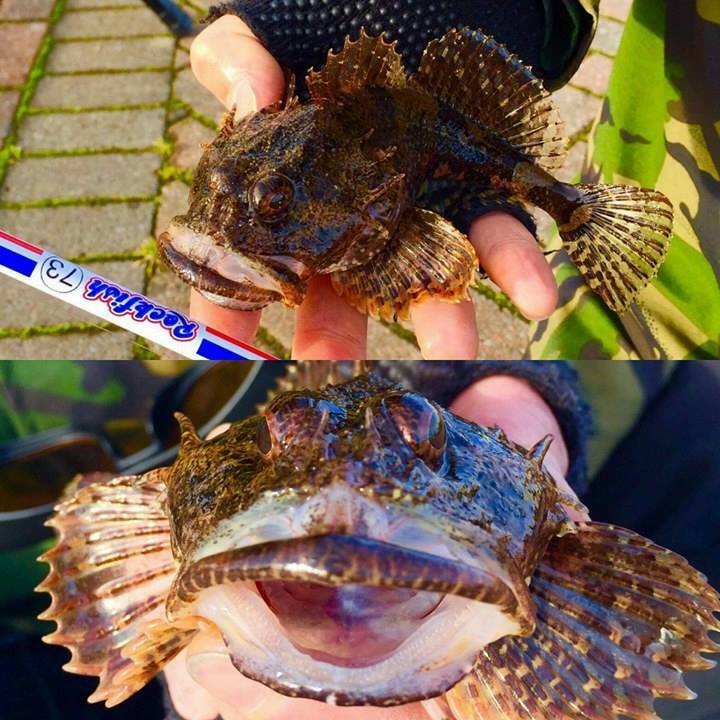 The bass is the poster boy for heavy rock fishing, the carp for specimen coarse fishing and when it comes to LRF, one species is synonymous with the technique, the long spined sea scorpion. The long spined sea scorpion, all fins and fury. It’s easy to see why this species is so popular, it’s incredibly photogenic! 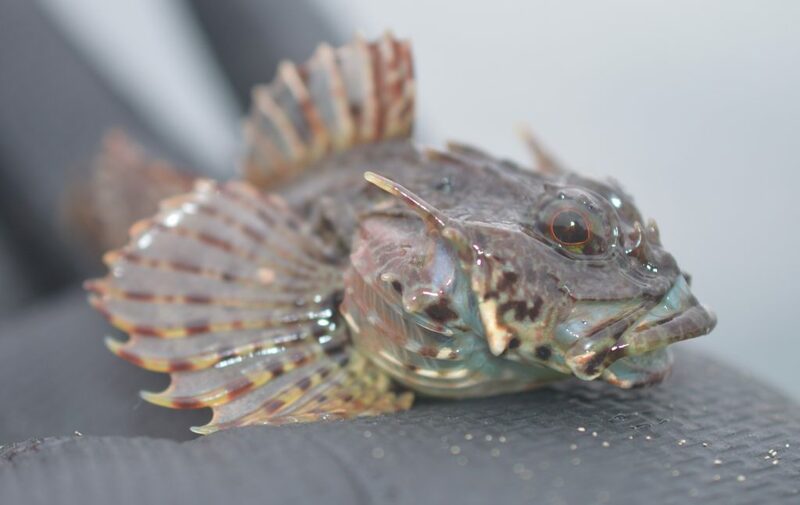 Looking more like a venomous fish from the tropics, their habit of puffing up their spikes when handled makes every photo look epic. For such a small species, they are so individual and surprisingly aggressive, it’s inevitable that they capture the imagination. In the UK we have two species of sea scorpion, the long spined and the short spined. Certain areas have more of one than the other, but the general rule is that the long spined is more common. It is also the smaller of the two, the record standing at just nine ounces, whereas the short spined grows to a significantly larger two pounds. Colour patterns of both species are extremely varied, from bright red, to purple, blue, black and dark brown, no two fish are the same. Combined with stripes and spots, these are beautiful creatures to behold. A short spined sea scorpion, notice the short spines and bulkier build. This one was caught by Jamie Sandford’s dad, Jamie kindly letting me use the pictures for comparison. Habitat-wise these fish prefer rocky areas with plenty of ambush sites – whether those rocks are naturally formed or artificially like harbours or sea defence walls, scorpions do not seem to be fussy. I’ve certainly found that rocks that border open sand tend to be prime feeding areas for these little predators. Though they hunt primarily through ambush, scorpion fish are surprisingly mobile. They quickly follow the tide up, whether this is swimming up the channels and gulleys in rocky areas or moving to and up the harbour wall. I once spent a day fishing the tide up on a sea defence made of boulders, the scorpions clearly moved in from the beach in only inches of water, you would get takes only at the edge of the tide. It was great evidence of the fish moving up with the rising water. 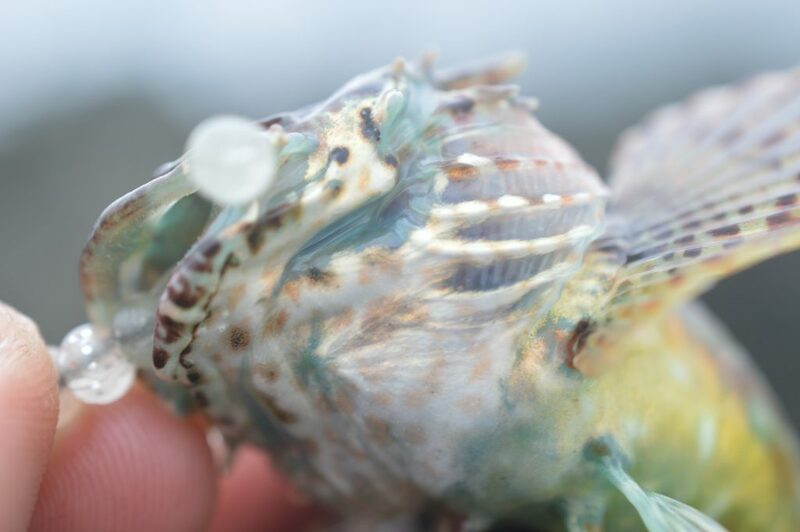 This angry looking specimen was caught in inches deep water on the rising tide. Long spined sea scorpion have a mouth almost the width of their entire body, combined with a powerful digestive system, this is a species that can eat something almost the size of itself! As an angler this can lead to some entertaining catches, with lures and baits intended for larger species being gobbled up by this most greedy of mini-species. Their preferred food is normally prawns, shrimps, small fish and other small crustaceans and worms. This gives the LRF angler plenty of lure choice to target them, I will say though that personally, small silver or pink straw/ball tail lures and red Isome worms have been the most prolific for myself. Probably the toughest part of targeting scorpions is catching every other fish species. Scorps’ share their habitat with all the other mini-species and singling out just them can be difficult. If you are fishing crystal clear rockpools or gulleys, then sight fishing is both exciting and effective. If you don’t have that luxury, say in deeper water like you find in harbours, then you will likely catch every other species before your target. Obviously this is the joy of LRF but if you’re on a species hunt, it’s worth being slightly more specific. A worthwhile tactic is to use slightly larger, unscented fish or prawn imitation lures, either dropshotted or on a jighead. You will catch less gobies and blennies, hopefully singling out your desired scorpion. Of course my best advice is to fish through all the species until you catch one, everyone loves variety. With a Ballzy Worm lure in it’s mouth, this one was covered in glorious colouration. 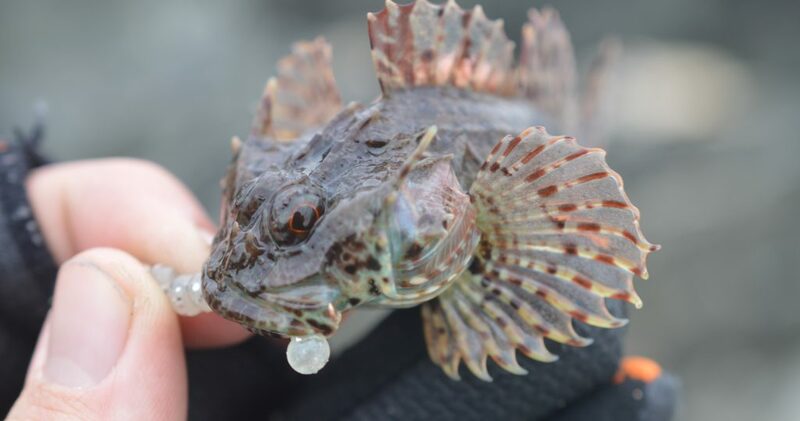 Once caught you will quickly discover a few things: one being that although these fish have no real teeth, they have a powerful bite, easily latching on to your hook or finger! It’s not going to hurt too much, but it might bend your hook if you’re not careful in removing it. You might also be lucky to be experience the vibration they give out when threatened, it’s like a mobile phone going off in your hand. Overall you can’t help but be enamoured with the character and pompousness of this incredible little fish. As I always say, look after your catch, they are tough creatures but deserve our respect. Careful catch and release is always the way forward, you never know it might lead to catching that fish again! You can also find me on Facebook here. Feel free to contact me if you have any ideas on what fish profiles you’d like to read, if you would like any advice or if you just want to talk fishing. I’m on Instagram too, search – benbassettfishing. 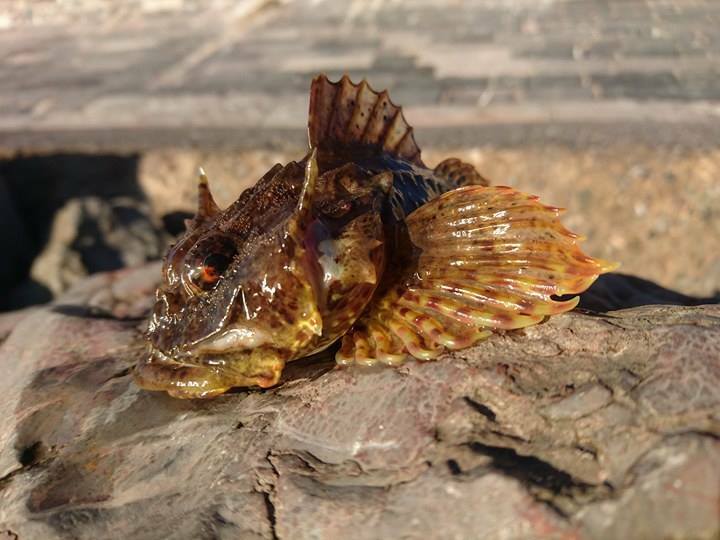 One Response to "LRF Profile – The Long Spined Sea Scorpion"